Our venues comply with the rules governing range safety and are registered with Archery GB. The range compliance certificate for each location are below. 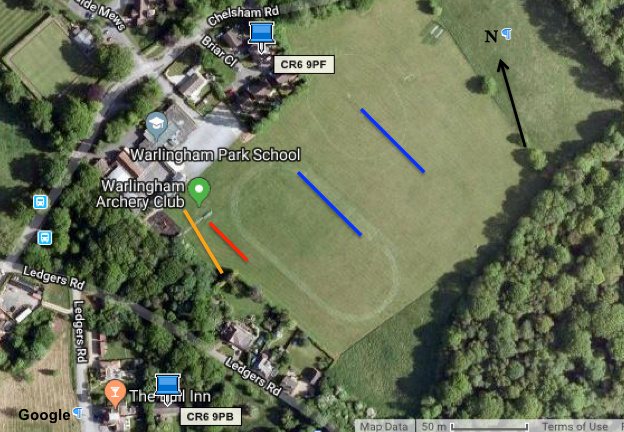 The shooting field at Warlingham Park School, �Chelsham Road, CR6 9PB (Google Maps). An aerial shot of the field showing the shooting lines (orange = clout, red = target, blue = 2-way longbow) is at the bottom of page. Indoor shooting venue at Kenley Memorial Hall, CR8 5AB �(Google Maps). You can park either outside the Hall on Godstone Road or in its car park - to reach this you must turn into Hayes Lane, then 1st left into Station Road, then as the road turns left the entrance to the car park is on the right.